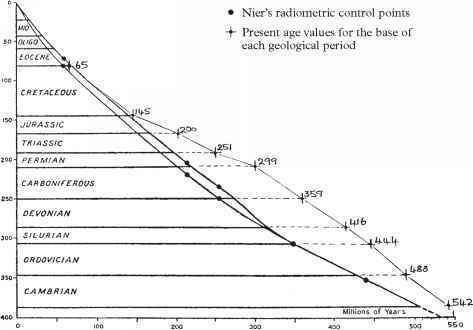 For Earth Time, Holmes's development of the geological time chart allowed him to publish in 1947 a graph based on the calculated radiometric ages of a number of rocks, which could each be fairly accurately tied into the known succession of strata within certain geological periods. Even so, there were only five reliably dated points between the Cambrian and present, ranging back as far as 450 million years to a point in mid-Cambrian times. However, a curve drawn between the points allowed rough estimates of the duration of each geological period to be made for the first time. A major difficulty with radiometric dating is that most minerals that can be dated by this method are formed from an initially molten state within igneous rocks. There are exceptions, the most important being the radiocarbon method of dating certain archaeological materials. 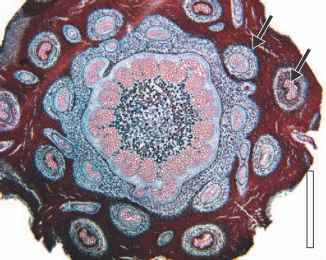 But because of the short half-lives of the daughter isotopes, the method cannot be used on materials older than about 50,000 years. Consequently, for the vast majority of Earth Time, igneous rocks are the main ones that can be reliably dated. Even then, we must always remember that there are error bars attached to all these dates. The problem for stratigraphers, who study the history of deposition of the sedimentary strata of the Earth, and palaeontologists, who study the fossils that such rocks contain, is how to relate the formation of igneous rocks to the deposition of sediments. Stratigraphically, the most useful igneous rocks are volcanic, lavas and ash deposits, which can be found interbedded with fossiliferous sediments. The problem here is that the most common isotopes found within volcanic rocks are those of potassium and argon, which have shorter half-lives than uranium and lead. Nevertheless, K/Ar and Ar/Ar dating of volcanic rocks has proved immensely useful in dating Tertiary-age strata, especially those associated with the Great East African Rift valley and their human-related fossils. Whenever you see a date in years attached to some human ancestor, the chances are that it has been derived from some volcanic rock layer near where the fossil was found. Holmes's 1947 version of the Phanerozoic Earth Timescale based on just five lead isotope ages originally determined by Alfred Nier, some of which are shown with alternative positions. Holmes arranged them against their geological positions in a vertical scale of the periods of Earth Time based on estimated thickness of the strata. now known that the early formation of the Earth, as part of the accretionary disc around the Sun, began 4.57 billion years ago. Earth's early growth was protracted, being dominated by planetary collisions, and it was not until around 4.51-4.45 billion years ago that it reached its present mass, with a metal core and primitive atmosphere.